Orbán has clashed repeatedly with the European Union and foreign investors over his unorthodox policies, and after Sunday’s win, big businesses were bracing for another term of unpredictable and, for some of them, hostile measures. But many Hungarians see Orbán, a 50-year-old former dissident against Communist rule, as a champion of national interests. They also like the fact that under his government personal income tax and household power bills have fallen. After 96% of the ballots were counted from Sunday’s parliamentary vote, an official projection gave Orbán’s Fidesz party 133 of the 199 seats, guaranteeing that it will form the next government. That tally also gave Orbán’s party the two-thirds majority needed for it to change the constitution, but only by one seat, and final results could still push Fidesz back below the threshold. “We have scored […] a comprehensive victory, the significance of which we cannot yet fully grasp tonight,” Orbán told a jubilant crowd at his party’s election headquarters. In terms of its share of the national vote on party lists, Jobbik won 20.7%, up from 15.86% of all votes four years ago. Its showing, based on incomplete polling results from Sunday’s vote, was the strongest of any far-right party in the EU in the past few years, according to Cas Mudde, Assistant Professor at the School for Public and International Affairs at the University of Georgia in the United States. He said the previous strongest result for a far-right group was the 20.5% won by Austria’s Freedom Party last year. Its leader, Gabor Vona, often works shifts in minimum wage jobs – a waiter, a construction worker – to show he is in touch with ordinary peoples’ concerns. A senior party figure in 2012 proposed drawing up lists of Jews in parliament, though he later apologised and said he was misunderstood. In the past four years, Orbán’s policies have included a nationalisation of private pension funds, “crisis taxes” on big business, and a relief scheme for mortgage holders for which the banks, mostly foreign-owned, had to pay. Orbán has pledged more of the same if re-elected, and the business community expects him in particular to press ahead with a plan to transfer big chunks of the banking sector into Hungarian hands, and impose more burdens on foreign power firms. More unpredictable policies could weigh on Hungary’s forint currency, especially if the central bank – led by a close ally of Orbán’s – cuts interest rates further from record lows, against a backdrop of jittery sentiment in global markets. “Big business do not want the frequent changes of policy, particularly in terms of taxes, which were characteristic of Orbán’s last term,” said Timothy Ash of Standard Bank. The election was a new low point for the leftists, who were pushed out of office in 2010. Some Hungarians worry that, without a credible challenge to his dominance, Orbán has accumulated too much power. Socialist leader Attila Mesterhazy declined to congratulate Orbán, saying the prime minister had won unfairly by changing the election system to Fidesz’s advantage and compromising media freedom – allegations the government denies. European Jewish Congress President Dr. Moshe Kantor said the electoral gains made by what he called the neo-Nazi party Jobbik in the Hungarian parliamentary elections should be a source of grave concern for Europe. 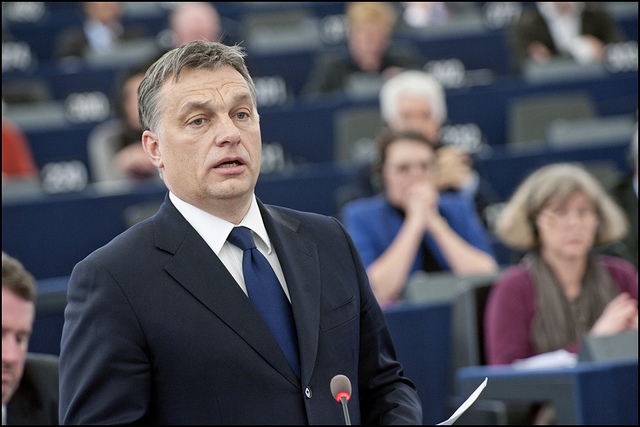 "I warmly congratulate Viktor Orbán and FIDESZ for today's impressive electoral victory. The people of Hungary have renewed their confidence in PM Orbán and his government because he has always spoken the truth to them and because he implemented courageous reforms, which put the country's economy back on track." "I am convinced that today's electoral victory by FIDESZ will also be repeated in the European elections." Coverage of the Hungarian elections is always a misrepresentation, either a result of lazy reporting and or wanting to have “sensational” headlines,or both since they are almost the same thing. There was a 60% turnout, meaning that Fidesz was voted by just over a quarter of the electorate. Jobbik’s vote cannot be used to show 20% of Hungarians support the far-right. Fidesz actually got 800,00 fewer votes than in the last elections and opinion polls throughout the past four years show a majority have been unhappy with Orban and Fidesz. The problem in Hungary is the opposition, which is too immature to grow up and put a coherent and convincing programme together and use new faces and new ideas. The Hungarian electoral system, which Fidesz also managed to distort during the last four years, is also a mess, possibly giving a party with the support of 26% of the electorate and 44% of the votes control of 75% of the parliament. There is an analysis here, which Euractive and most foreign media won’t bother with. I find it hard to believe that the head of theEuropean Jewish Congress Dr. Moshe Kantor should refer to the danger of democracy being appropriated, to do this would infer that there is democracy within the eussr, rather than the palpable democratic deficit in brussells. It is noticeable that the political group the party is attached to is the largest in the eussr parliament, so is he saying this is a far right nazi group? Hi Barry, what do you think of Putin’s plans for a Eurasian Union? Oh, and not that you would be aware, but Orban was waxing lyrical about how he had secured Hungary’s place in the EU last night!